Painter 5 was a bit of a transition for the core team. John Derry and I were no longer really in charge of the taglines and the copy. But we totally rose to the occasion when it came to the UI and the features. John and I redid the UI to cut down on screen real estate, which required endless work. I implemented a whole host of new brushes. I could go on and on about the new brushes. When Tom Hedges and Bob Lansdon created the first version of watercolors for Painter 2.0, To added an ability to allocate more than just 32 bits per pixel to either the canvas or even a layer above the canvas. As time went on, we used this feature more and more. For the new water droplet and liquid metal brushes in Painter 5, we allocated another 32 bits per pixel and made it a floating point height field. As we added items to the height field, it could be thresholded, and height-compensated to make it look like there was surface tension, and then rendered into the main 32-bits of the layer, which had the RGB color and an 8-bit alpha mask. There was plenty of work to do, with these and many other new features. My friend Udo Gauss came out to Aptos during this time frame and I showed him a metaballs implementation, the basis for these new layers. We talked endlessly about how it might be of use to Painter users. John and I, meanwhile, worked on a monogram-style logotype for Painter 5. John was keen on using a human hand as a primary image, because one of the basic things about Painter is that you use your hands to make art, and Painter is just an amplifier for your talent as a mark-maker and an artist. Above, you can see an interlocking logo form for Painter 5, with a P and a 5 intertwined that I drew. I got this idea by looking at the royal interlocking monogram chiseled into Danish King Christian IV's sarcophagus in the Roskilde cathedral. 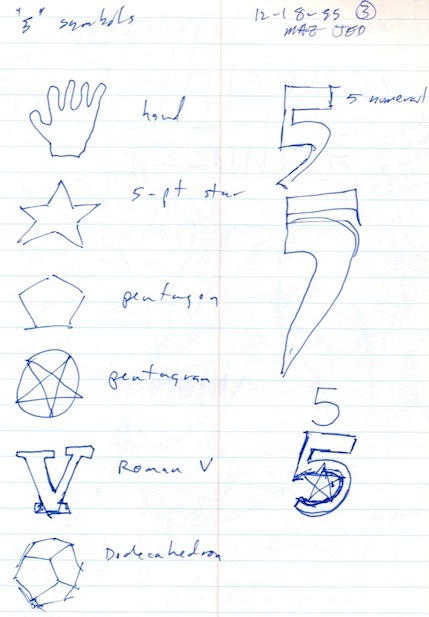 John's take, shown to left, is a 5-pointed star, the numeral 5 overlaying a pentagon. I think the brickwork is another bit of charm in this one. His attention to detail goes on and on. For a quick sketch, it's not bad. To the right is another example of a joint work page from a notebook. Almost all of the numerals are John's work. 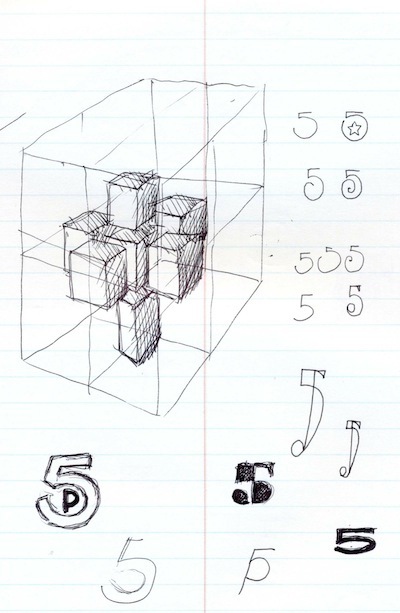 The seven-cube design is my work, it looks like. The really interesting symbol on the page is a 5 with a small p inside it. I think this might have been used in a coin he saw once, perhaps a five pence coin from England. In the top right, several 5's are shown with varying degrees of thin-line styling, perhaps similar to letters from the Art Deco or Art Nouveau eras. Some of them even have serifs. I really like the squat 5 in the lower right, with its bold line. 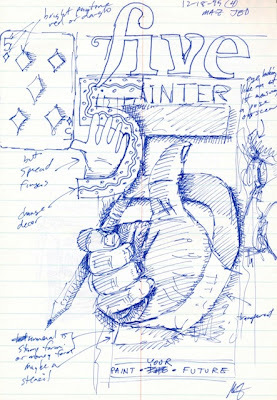 This shows the endless doodling we did that often produced interesting results, and sometimes ended up in ad copy, splash screens, and other graphic work we produced. For every genuine idea we had, really only a small percentage of them actually got into actual use. I think it is often that way with designers in search of a good logotype. I have been to design houses, in particular Landor Associates in San Francisco, and I totally respect their work and the attention to detail and the perception of their client's customers. With Painter 5, we were trying to think up something to do with the paint can. With Painter 3, we used the paint can in the posters, and the tagline Pour It On was used. With Painter 4, the can was done in mosaics. To the left is a sheet of John's ideas for the logotype and for the paint can itself. It is really no great wonder that we didn't use the cloudy thunderbolt paint can. 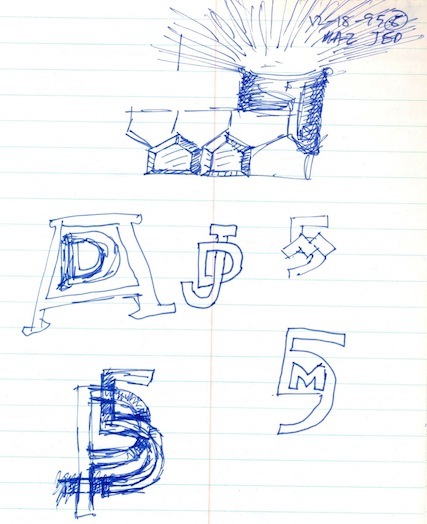 In the upper right you can see John's take on the interlocking monogram concept. Both of us vetoed it. 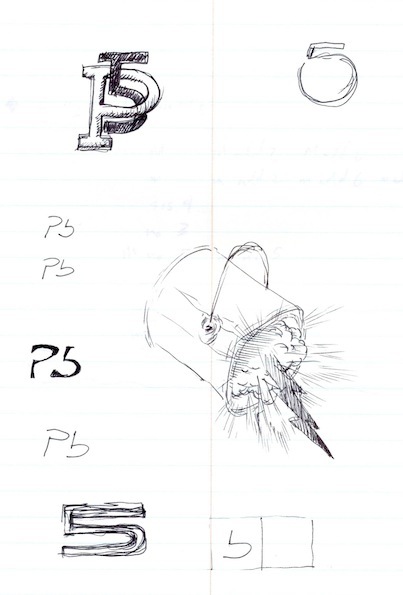 Some of his stylings to the left show a P5 logo with the top of the 5 missing, so it resembles Pb, the atomic symbol for lead. John returns to the squat 5 concept again at the bottom. I still like it, but I'm not sure how it can serve with Painter. 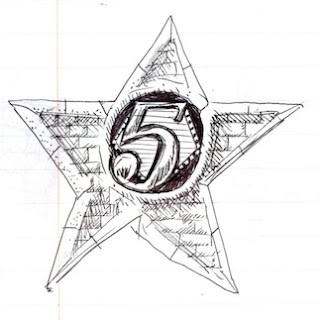 So, the question got raised: exactly what was the best symbol for 5? Was there a symbol that meant the most to artists? We decided to sketch out a few and see what stuck in our minds. To the right is a sketch I did that summarized what I thought might work from a standpoint of straight symbolism. I also drew a few clumsy numbers out as well. The first and most useful was the human hand. Once again, the mark-making instrument, the center of the artist's expression, was used. A 5-pointed star also has sticking power. Though, I pointed out, it also symbolizes glitz and fame. Not necessarily good for Painter. A pentagon wasn't too bad a symbol. But it had military significance, especially since a pentagonal building houses the department of defense here in the US. A pentagram was an occult symbol. Neither John nor I was necessarily wild about going down that particular path. 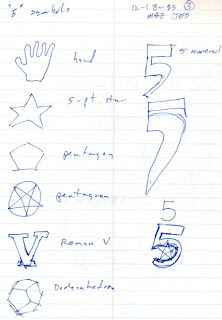 The Roman V for 5 was a good, ancient reference to the numeral 5. Very old-time. Maybe. The dodecahedron was a bit abstruse for the Painter audience, but I had to put it in. In the end, the human hand was chosen as the symbol. 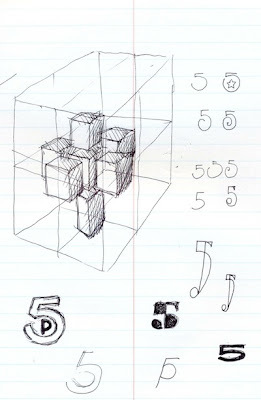 Here is a sketch I did with several references to the number 5, and in many forms. Annotations were applied to it, because we were thinking of using it as an ad design. When we did an ad design for Painter 5, I actually did the ad myself. It was a hand, with fingers spread, the fingers were on fire, and the numeral 5 was done in liquid metal in the palm. This was a reference to a scene from my youth where my dad showed us kids the element Mercury. I actually had some in my hand. Had I known it was terribly poisonous, I wouldn't have done that. The ad, when done, had a kind of illuminati look to it. It was actually my hand, too. Crazy. The ad ran in lots of magazines, but I don't have a copy to show you, I'm afraid. Update: I found it! The artwork for the Painter 5 ad piece with the hand and the burning fingers and the liquid metal 5 can be found in this blog post toward the end. The work on a monogram something we found to be quite fun, and very much pure design work. Here, my sketches for monograms are shown to the right. The can is present, with a radiant brilliance coming out of it. Beveled pentagonal tiles are in front of it. 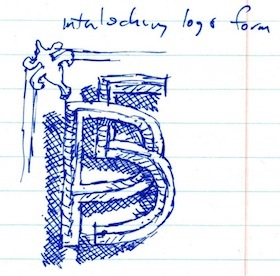 The Albrecht Dürer monogram is alluded to (though he did it with the D below the mid-line of the A). I did a little John Derry monogram in the middle. I have no idea what the M5 monograms were getting at. But we had lots of fun in the process. In the end, we used a brush stroke version of the numeral 5, to match the Painter brush logo.